Olivia Bax’s sculptures in the current exhibition at Fold Gallery, ‘Zest’, have a sense of the transitional; they hint at vanished occupants or abandoned spaces; they are indeterminate in nature. The artist’s open-ended approach and positioning sets up, for the viewer, a visual and physical negotiation with the in-between nature of the work, through its repetition, intervals, and specific colour choices. Bax’s unifying surface facture sits on a constructed framework, which seems to have a generative impulse. Her constructivist approach and linear system, already developed in earlier works, is integral to their relationship with these gestural implications. Her phenomenological approach allows the viewer to move around the work, to go through it, and even experience the spaces inside. The works’ sense of entrapment is key to their success. In a similar way to works like Every Which Way (2015) by Richard Serra, Bax sets up a dialogue with the site specificity of the gallery itself. She opens links through history that support her use of composition and structure. For example, a ‘palisade’, used in the Roman Empire or by the Ancient Greeks, is a barrier around a forts or settlement. Made of sharpened logs, these fortifications protected the occupants from attack or plunder by outsiders. Palisade uses intense colour that enables instant, simultaneous perception of the work. The wooden armatures are covered (by hand) with paper pulp, strips of polystyrene, PVA, plaster, and hessian, giving them a cohesive identity, hermetically sealed. But it is the rhythm and sense of movement that creates the work’s multiple viewpoints. I am reminded of a similar rhythmic impulse in Chance, Order and Change 6, by Kenneth Martin, in which a network of lines is marked and adjusted in a clockwise direction around a rectangle. Bax maps out the space in Palisade with the same kind of bird’s-eye view that Martin generated when he randomly chose numbers out of a bag, before rotating the drawing twice through 90°. This sense of chance and order is initiated in one of Bax’s earlier works, Bish Bash Bosh. Here, the structure is tied together just enough, with silicone and armature wire, to prevent the work collapsing. Bax uses the height of the internal walls of the gallery that surround the work to suggest something like an empty, deserted swimming pool. In Palisade the suggestion of a more systematic position is hidden beneath the physical rendering of the surface. Bax spent some time working with Anthony Caro, and it seems clear that she admires his technique of adding an extra dimension, such as the wheel in Emma Dipper (1977). I like the way that Bax uses this feeling, but finds her own angle, by positioning works like Droop and Pause away from the main sculptures, like fragments of an umbilical cord. The scale of these works, and the speed of their execution, add another dimension to the viewer’s experience of the space. However, Bax does not seem to be interested in a fixed static environment; in Zest we are aware of the pliable surface. The presence of a playful geometric transformation is more visible here, and hints at a work like Anthony Caro’s Early One Morning. The colours’ inconsistencies are characterised by Bax’s physical procedures: the manipulation of the highly pigmented panels in a dense warm orange or white. This time, the positioning seems to conform to a human shape; we sense that each curve, like an outsized sponge, fits around its maker. We are not sure how heavy the curved forms are, or whether the ultramarine ties that punctuate the surface hold in place a certain fragility. Bax plays with an illusion of weight and balance; Zest has a look of Serra’s Shovel Plate Prop (1969) but with a temporality and lightness of touch that manages to convey an historical cataclysm, through the interchange of elements and atmosphere. Olivia Bax’s ability with the weight and signification of colour combines brilliantly with her structuring of negative space. 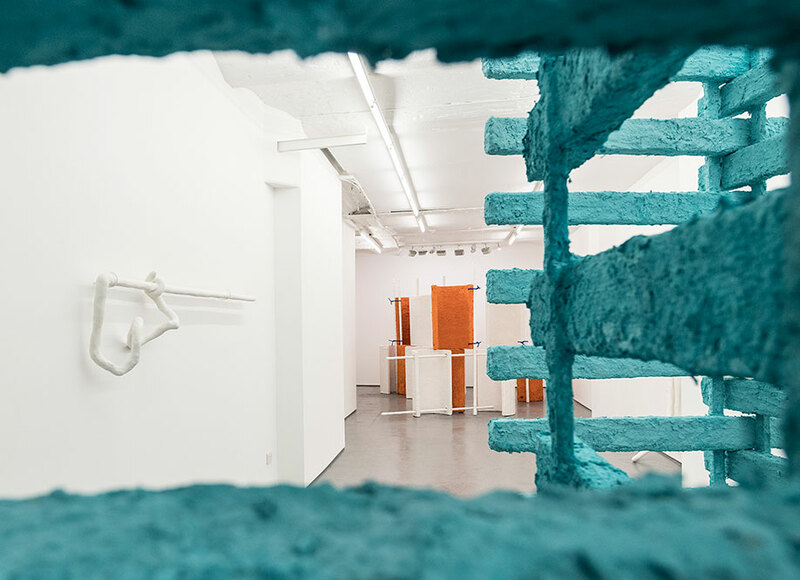 Oscillating between confrontation and playful humour, the two opposing sculptural installations, Palisade and Zest, feel, in one way, to have been inaugurated at the same moment, but in another way, the transmutation of ‘two into one’ brings an understanding of the experience as a whole.